So, let’s say you’ve got this animal, and you’ve got to take care of it. In the vast majority of cases, ‘taking care’ of the animal includes enclosing it in some way, whether it be in a tiny box or a giant fenced park. In general, in order to care for an animal’s needs, you need to have access to that animal, and to be able to control what it can encounter. For example: oxygen, food, and water are three things you probably want any animal under your care to encounter. Predators and pathogens are two things you might want to keep out. But of course, these are the most basic needs an animal has, and what I’m describing is the bare minimum of animal care. In other words, animals can live with their basic needs provided but not thrive. The distinction between the two is a rather recent discovery as far as animal care goes, and even as far as human care goes, as we shall see. In any case, enclosure design is one of the most important animal welfare concerns of the day, and current captive animals are kept much differently than they used to be- hopefully, to their benefit and ours. In this first post on the topic, I’d like to go over, briefly, the history and the science behind what we know about keeping captive animals comfortable and engaged. This is not meant to be a guide to keeping any species in captivity, just to clarify. But it will, hopefully, help you consider the needs of any animals under your care in new ways. Is There Value to Captivity? 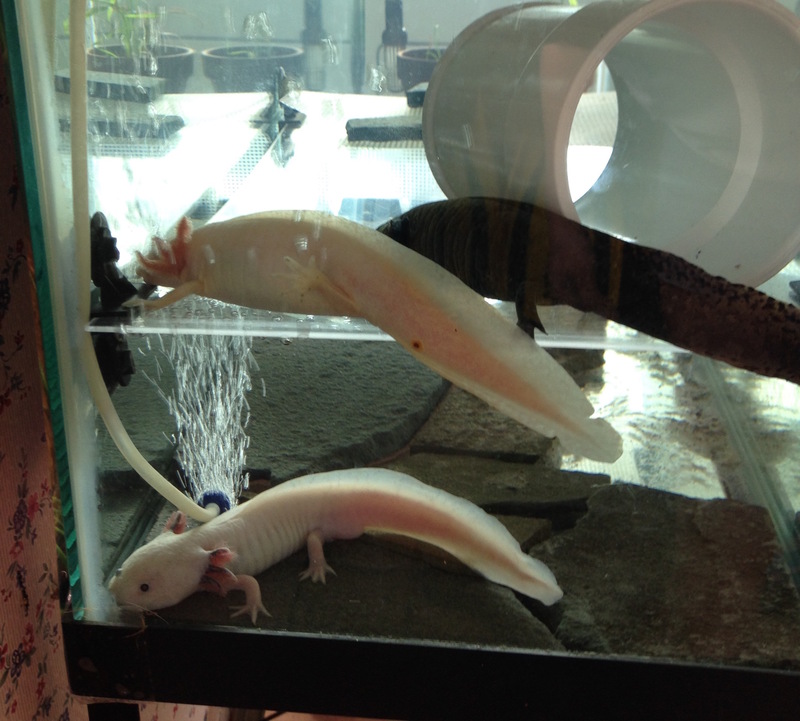 Speaking of caring for animals, I keep four axolotls as pets. If you don’t know what an axolotl is, it’s essentially a large weird salamander. A bit of background knowledge on axolotls: their habitat in the wild is restricted to a single set of canals in Mexico, and their population is in rapid decline. By now, they may even be entirely extinct in the wild. Yet they have a huge captive population. It isn’t as though axolotls are difficult to breed, feed, or exquisitely sensitive to certain water parameters- rather, they are resilient and hardy critters who will eat most anything that fits in their mouths and make salamander love willy-nilly. The problem is that in the wild, they have nowhere left to go. As I mentioned, the axolotl’s habitat is a single set of canals in Mexico. If this seems bizarrely restricted, that’s because it is: the canals used to be a vast lake, Lake Xochimilco, which was part of a system of five lakes: the other four have vanished. The cause is, as expected, human activity. 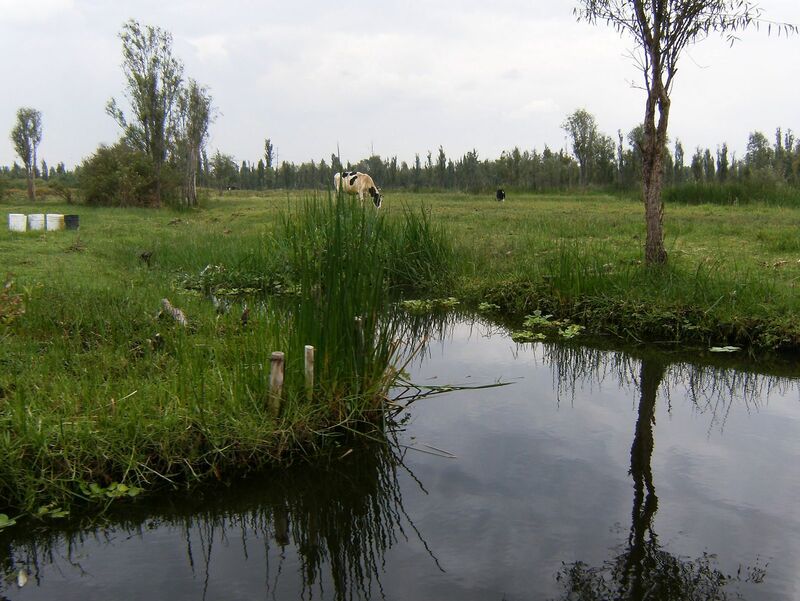 Pre-Hispanic cultures farmed crops by piling mud and decaying vegetable matter in the shallow lakes to form floating patches called chinampas. Over time, as the population grew, massive numbers of people were living on the lakes themselves- Mexico City is, in fact, built on these former lakes. Much of the water was drained away in modern times to prevent flooding. So the axolotl is left with a few canals that run through one of the most densely populated urban centers of the world. I bring up the axolotl’s wild habitat because it presents an interesting challenge to what the word “wild” really means. Is an axolotl in a manmade canal in the center of the city still really wild? If so, are the polluted, refuse-choked waters really the best place for axolotls to be- if there are even any left? Even if the axolotl is extinct in the wild, it is in no danger of actually going extinct. There is a huge captive population of axolotls, split between laboratory animals, pets like mine, and a few in zoos as well. As I said, they are not difficult to keep or propagate. And I would be remiss if I did not acknowledge the efforts of groups such as the Durell Institute and the Mexican government to conserve and protect the wild axolotl. But for the most part, there is no longer really such a thing as a wild axolotl- the species is maintained by artificial human life support. If we stopped, there would be none left. And the axolotl isn’t the only animal with this issue. It is oft-repeated that there are roughly 7,000 tigers in captivity versus 2,000 in the wild- though few realize that about 4,000 of the captive tigers reside on Chinese breeding farms, where they are raised for use in traditional medicine. Like the axolotl, the tiger has no trouble breeding in captivity: the problem is that it has fewer and fewer wild places to go. It is also important to realize that the vast majority of tiger and axolotl populations are effectively null for use in rewilding efforts. Why? Bad breeding. The pet trade’s fascination for rare color morphs and disregard for things like subspecies and natural behavior has led to highly inbred captive individuals that lack the survival skills to propagate without human assistance. Albino axolotls and white tigers would not and will never survive in the wild, yet people love to see them and hence, here they are. Accredited zoos are perhaps the only groups heavily invested in maintaining rewild-able genes in their captive populations, and even then, they are still confronted with the issue of not having enough habitat to put their animals back into. Further complicating this is the sheer difficulty of introducing a captive population back into the wild, especially in a habitat where the species has largely been absent for some time. Successful reintroduction attempts, such as the black-footed ferret (which was bred from 18 remaining captive individuals) are still relatively rare. What, then, is the value of a permanently captive species? This is actually a very interesting question, because we are forgetting certain groups of animals which are very valuable to us. There was once a large, bison-like animal called an aurochs, which roamed from North Africa through South Asia and most of Europe in the thousands. Now the aurochs is extinct… in the wild. But it lives on in the form of domesticated cattle, in populations far larger than their wild cousins ever had. Most would agree that in terms of sheer monetary value, cows are fairly important to us. 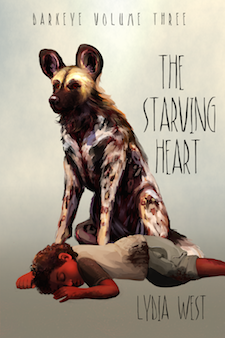 Indeed, this is the story of nearly all of our domesticated animals, from dogs to horses. If a wild population even remains, it is small and dwindling, but captive populations are incredibly robust. We humans have a habit of multiplying what we like about an animal and tossing the rest. So there is certainly value in captive animals for humans- but not necessarily for their wild relatives. In many cases, having huge captive populations of an animal can actually hurt conservation efforts more than help. If we consider at the aurochs, the wild cattle were largely edged out of existence by domestics whose herders shot grazing competitors. In many other cases, making an animal popular as a pet or in the public consciousness only fuels the black market trade for members of the species, whole or in pieces. 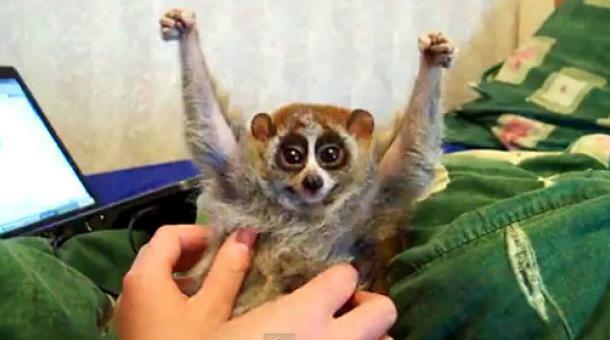 Have you seen the cute video of a slow loris being ‘tickled’? So have several million others, and a good chunk of them want to buy one. As cute as it seems, this slow loris is actually exhibiting a defensive posture. At this point, you may be thinking that captivity is the doom of all wild species. But that isn’t quite the case. If you look at the comments on any “pet” slow loris video now you will see a stream of comments angrily denouncing the owner for animal cruelty. The popularity of that original video was what prompted a large-scale effort by scientists and animal lovers to educate the public about the ethical mire of issues behind keeping these primates as pets. With education comes larger-scale funding towards combating the black market trade, which is a large cause of the wild species’ decline. The slow loris species probably gained net harm from the release of that video, but for other species, it may have helped by making people naturally more suspicious of ‘cute’ exotic pet videos. If widespread exposure of an animal leads to proper education about that animal, there is a conservation benefit to captivity. Indeed, education itself is one of the largest values- in terms of conservation- of keeping captive animals. And enclosure design has much to do with this. The more people see animals in naturalized rather than humanized environments, the more likely they are to express interest in the animal’s conservation. Likewise, though successful wild reintroductions are rare, they are slowly becoming more feasible as conservation science advances, making captive populations function as better genetic repositories. 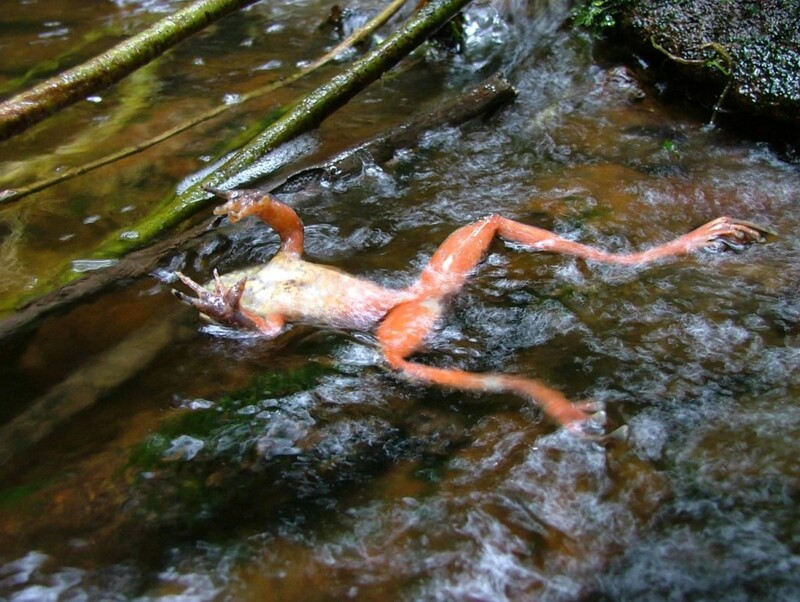 Indeed, with non-habitat-size-related threats such as disease or parasites- chytrid fungus in amphibians is a good example- healthy captive populations may be a very good thing for wild species. We’ll discuss the difference between these two states in a little while, but first, let’s delve into a little more background. I’m going to bring up my axolotls again, and I swear it’s not just because I like talking about them. I acquired my first two weird salamanders while taking a college course on developmental biology. The axolotl is a much-prized laboratory organism for its ability to regenerate nearly any part of its body via the conversion of adult cells back into a form of stem cells. For a vertebrate, this ability is a Big Deal. 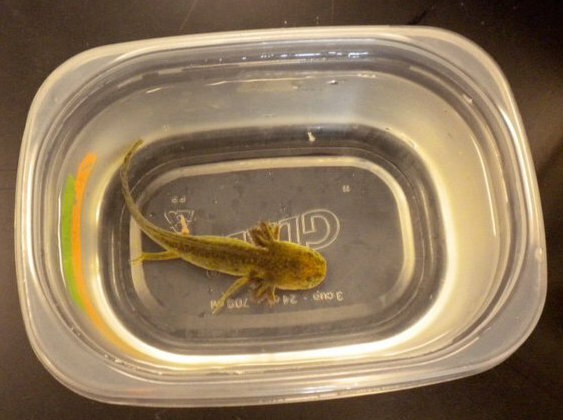 The lab, it should be noted, kept their salamanders in highly scientific tupperware containers, with just about enough room to turn around for each axolotl. They were not kept in plain water, but rather a specialized mixture of salts added to water called “Holtfreter’s solution.” This solution was changed every other day. The largest axolotls might also have bubblers added to their containers, but otherwise, that was about the extent of their habitat. Naturally, to me, this seemed a bit heinous: at the time I didn’t know very much about salamander behavior, but I did figure that the animals would want at least enough room to move around in. My TA informed me that all I would need to keep them was a plastic bin and a bubbler, but I wanted something different: a lovely, interestingly decorated tank, where my axolotls would frolic and rejoice for their improved lives. If you have owned aquatic animals for more than, say, a year or two, you will realize that it is bizarre that they are marketed as “beginner’s pets.” Nearly every aquatic creature you can purchase as a pet might be qualified with the advice that it “dies easily,” but it isn’t that the animal dies easily- it’s that we humans barely understand the intricacies of water quality for those who breathe it. Imagine being trapped in a sealed room, surrounded by water, and your life depends on a school of confused fish. You have to hope they remember to change your air frequently enough for you to not suffocate on your own exhaled carbon dioxide, that they remember to remove your waste, which is piled in the corners and stinking up the room, and that when they do give you fresh air it’s composed of the precise gaseous mixture that humans evolved to breathe. When we keep non-aquatic animals we usually don’t have to worry about that thing they breath, but fish are another matter. Captive fish were not commonly kept in tanks (well, for long, at least) until the 1850s or so, because a bewildering number of factors have to be managed in order to keep a tank healthy. The issue is the disconnect from a larger ecosystem. Just like we would rapidly experience dramatic changes in air quality staying in a sealed room, so do fish in water separated from larger bodies, with all the associated bacteria, soil, plants, and others in play. I am not saying that axolotls do not benefit from increased space to move around in, variable habitat to explore, or the presence of others of their own kind (so long as everybody is an adult). However, the nicest, most enriched aquarium in the world could still be considered a welfare concern if the water quality was not up to par. To be quite blunt: the welfare of many captive axolotls in extremely nice-looking tanks is worse than the ones in the one-gallon lab containers simply because their first and most essential need is not being addressed properly. You, in that sealed room, would not care how nice it all looked and how much stuff there was to play with if you were choking on your own emissions. 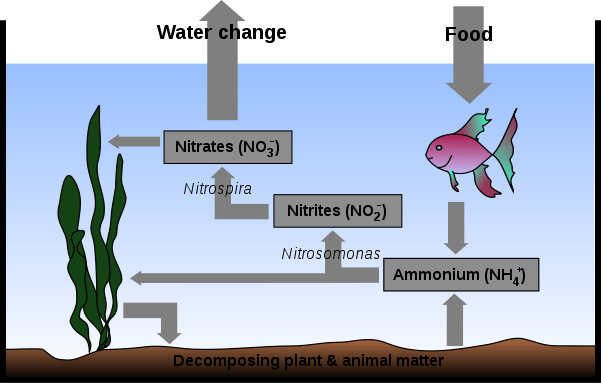 Things you should know if you want to keep a fish (alive): the nitrogen cycle. I discuss the difficulty of housing axolotls and other aquatic animals properly because it speaks to a larger issue of humans poorly understanding animal needs. You cannot assume that any animal will thrive in an environment that appeals to our sensibilities only. Furthermore, many animals that aren’t as familiar to us- I’m talking animals that aren’t mammals here- display signs of stress in ways we can’t see or read. A fish that “died easily” was likely shouting its problems in a language its caretaker was unable to understand. Some of the earliest steps in improving the lives of captive animals revolved around limiting and simplifying their enclosures in order to better serve their basic needs. It’s true that a lion enclosure looks nice with a little grass, but grass hides urine and feces, which need to be cleaned up fast to decrease the risk of disease (plus, it stinks). So concrete is better, because it can just be hosed off quickly each night. Complex environments also offer more opportunities for an animal to hurt itself, by getting stuck, or breaking something and getting cut on a sharp edge, or simply by leaping and running around. Better keep it as simple and manageable as possible. In fact, having any other animals around is a risk too- a risk of getting hurt in a fight. So keep them all alone. To our modern sensibilities, this “hard architecture” sounds like an atrocious way to design an enclosure, but for the early zoos, it was the best way to keep animals alive. Without a background in what the psychological value of enrichment, exercise, or social interaction was, in the 1930s and later zoos focused on merely keeping their animals as clean and injury-free as possible. So naturalistic gave way to sterile in the later 1900s. (Actually, before city park zoos, even EARLIER zoos were rich person’s menageries which were also pretty non-naturalistic, so the pattern has really gone back and forth over time.) Zoo animals were not the only ones that the new, cleaner mindset affected: as human populations became more dense and industrialized, farms were increasingly expected to maintain larger groups of animals on less land. The pasture, barn, and then the feedlot emerged during this time period. Disease and injury became a major threat in these conditions, so animals were kept in more and more isolate and easy-to-clean conditions. 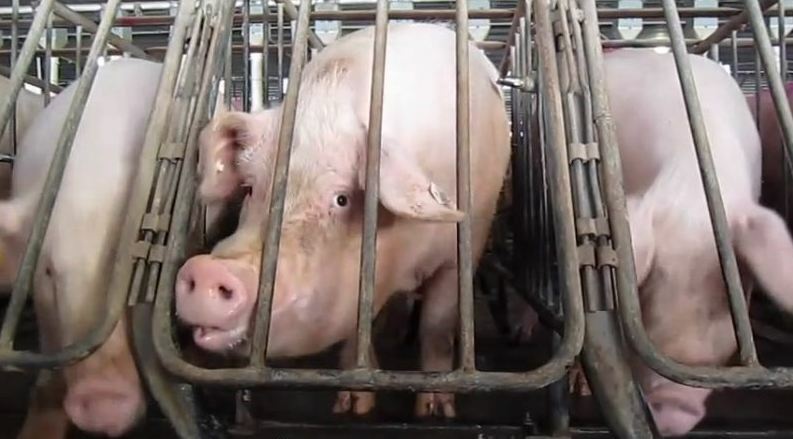 Things like farrowing crates for pregnant sows were a natural result of this mindset: they stop the sow from being able to get up and potentially crush her piglets. Since then, zoos have changed more rapidly than farms towards a more psychological welfare-focused design, largely because zoos rely on public visitation and farms rely on production. But even for zoos, the changes came slowly at first. From the 30s onwards, ‘modern’ science dictated that bodily health was the only health that mattered, and that concepts like ‘play’ and ‘affection’ were mere artifacts of the romantic minds of uneducated people. It wasn’t just animals that were kept sterile- in the increasingly dense population centers of mankind, humans were being treated in a similar manner, particularly those in hospitals or orphanages. The fear of disease was understandable: it was everywhere. City orphanages limited social contact with their charges for fear of infecting them or spreading already-present sickness. The prevailing theory of what ‘love’ was at the time was that it emerged in infants when they were fed by their mothers (thanks, Freud), so all the caretakers needed to do was make sure the orphans were kept fed… right? 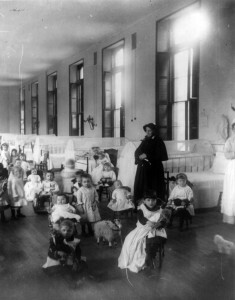 However, a new disorder began to emerge in isolated infant patients and orphans. Termed anaclitic depression or ‘hospitalism,’ it could lead to a weakened immune system, mental retardation, and even death. No germ or disease was the cause. The research of Austrian-American psychoanalyst René Spitz was among the first to address this syndrome, and what he found was probably unsurprising to those of us in the world of today: limited contact with infants by caretakers was what was causing them to literally waste away. In contrary to most recommendations to mothers at the time, Spitz argued that physical contact and affection between mother and infant was not only healthy, it was necessary for proper development. Harry Harlow’s experiments with monkeys took this idea even further. To determine whether “love” emerged from feeding or physical contact, he removed infant macaques from their mothers and provided them with two surrogates: a wire one with a bottle stuck inside it, and a cloth one without any food. The monkeys ate from the first, but spent the rest of their time cuddling with the second. Harlow coined the concept of “dependency” for infants from this experiment: infants look to their mothers for more than simply nourishment. This seems obvious to us now… but it was a massive revolution then. Of course, these revelations later flipped into the rather problematic concept that a child’s biological mother should be the one and only person to raise them, but that is a different article altogether. The reason I bring up this change in childcare because the public shift against sterile childhood environments was what also bled over into criticism of sterile animal environments. Harlow’s experiments in particular proved that being reared in deprivation has serious effects on both humans and animals. Around the 60s, there was a bit of a zoo revolution. 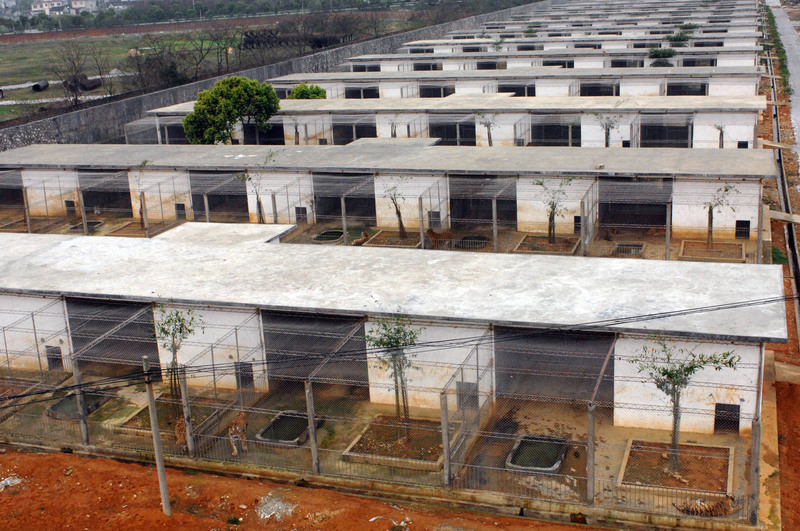 Presenting barren, sterile enclosures to the public was no longer acceptable. More and more research on animal mental disorders stemming from lack of enrichment led to a shift in animal husbandry practices not only in zoos but in laboratories and eventually farms as well. So zoos began to shift their focus from strictly physical needs to a more enlightened view of both physical and mental health. Initially, the focus was on reducing or eliminating disordered behaviors in their charges. The most well-known of these, of course, are stereotypies: that is, repetition of simple locomotor behaviors such as spinning, pacing, jumping, or swaying. Others include compulsive behaviors such as fur or feather-picking, nose rubbing, and self-injury. Beyond eliminating these openly unpleasant behaviors, zoos were motivated to keep their animals from seeming ‘bored,’ or, for the guests’ benefit, boring. This was easier said than done, because the zoos weren’t exactly starting from scratch. Even the best of enclosures cannot make up for long periods of deprivation, as research by Harlow and others showed. An animal raised alone in a small concrete enclosure would balk at the sight of an open, grassy one, and display fearful or downright antisocial behaviors to others of its own species (and get knocked about roughly in return). Further complicating it all was that no single set of enrichment or habitat modifications could hope to hover the vast range of species kept in zoos. Enrichment, by the way, refers to a number of things. It can be as simple as providing more than one type of food to eat, or as complex as providing multi-member social groups. Essentially, anything in an animal’s environment that engages the animal’s interest can be considered enrichment. 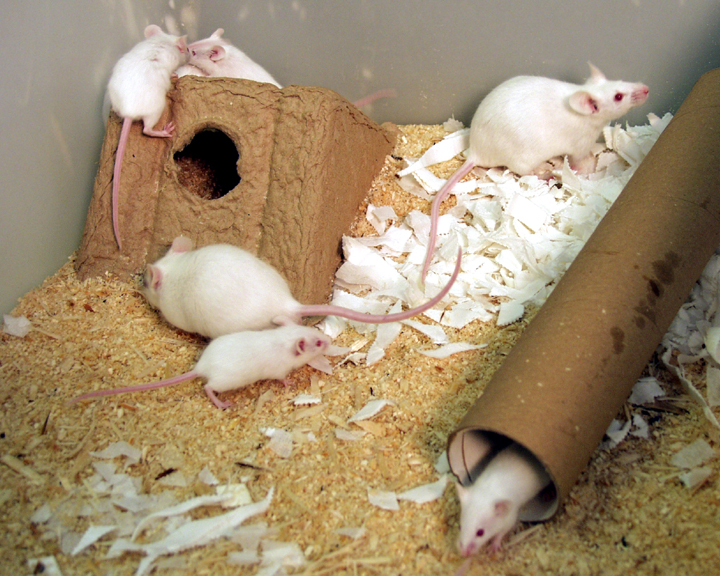 Enrichment studies with laboratory animals presented some solutions to these troubles. Animal labs in general are invested in maintaining large populations of animals at some sort of “baseline” physio-psychological state in a small space for a low cost, so naturally the greatest push for reform would come from them. Consumers not be able to (directly) taste the stress in a farm chicken, but in a lab rat extra stress can affect test results to a great extent. Of course, that is not to say that scientists doing animal research always understood this fact, and the keeping of laboratory animals, like that of keeping animals in zoos, farms, and even as pets, has changed a great deal over time. Indeed, it has changed so much that a great deal of research done in the past is barely appropriate to compare to modern research, considering the differences in the way the animal subjects were housed. However, many of these changes are invisible to the public due to the secrecy with which much lab animal research is carried out in today. While Harlow’s monkey studies are probably the most famous animal enrichment studies, and certainly a landmark in the shift towards providing more socially enriched environments for captive animals, there were others that came even earlier. In 1947, Dondald Hebb compared rats raised in cages without social contact to those raised as pets, and found that the pet rats were better at solving problems than the caged rats. This led him to develop a theory of brain plasticity- that is, a theory that an animal’s cognitive abilities can be shaped by experience as well as genetics. This was a big boat-rocker in the 1940s scientific community. It suggested that brains, much like muscles, could be strengthened by frequent use. Further studies showed the tremendous differences between the brains of animals growing up in enriched vs barren environments: namely, they had more synapses and dendritic connections- a physical manifestation of the power of enrichment. René Spitz also observed this phenomenon in a more outward form in his studies of orphans: those that grew up in orphanages were more likely to show cognitive impairments than those who grew up with their families. But from the standpoint of animal welfare, does having more neurons and connections in the brain really improve an animal’s life? The answer seems to be yes, for the most part. Having more complex neural networks can serve as protection against mental disorders of old age such as dementia and Alzheimer’s. It can also stave off the presentation of harmful behaviors such as self-injury and anorexia (yes, animals can have anorexia too, though it isn’t related to their self-esteem). In a more general sense, though, enrichment helps an animal physically as well as psychologically. Animals with more complex environments have reduced levels of stress and stronger immune systems then those without. The brain and the body, after all, are not exactly two entirely separate systems. So, as much as a lack of food or water makes an animal deprived, so does a lack of enrichment. Boredom can literally kill- slowly, but surely. So as animal caretakers, our aim should be to give our charges the best lives we can provide. This means that we have to think about more than just their physical needs. In modern society, the animals who provide us with food, clothing, and medical advances should be housed in a way that enriches their lives. And as wild spaces become smaller and smaller and active wildlife management begins to blur the lines between wildlife and captivity, it is imperative we learn how to help animals thrive- because in an increasing number of cases, we will have to provide the environments they live in. This wraps up my article on the background of keeping animals in captivity. In the ensuing parts of this series, we’ll discuss how to take all this background and history and use it to create captive environments that allow animals not just to live, but to thrive. Click here to continue reading part two of this series, Stress and Space! Read on: If you’d like to learn more about how mental disorders manifest in animals, I wrote a post about it here. I also wrote a post discussing my criteria for when keeping an exotic pet is ethical here. And to learn more about the blurring of wild and human spaces, I wrote about the white-tailed deer population problem in the US here. To view a list of all my nonfiction work, click here! Ainsworth, M. D., Andry, R. G., Harlow, R. G., Lebovici, S., Mead, M., Prugh, D. G., & Wootton, B. (1962). Deprivation of maternal care: A reassessment of its effects. In Public Health Papers (WHO) (No. 14). World Health Organization. Armstrong, D. P., & Seddon, P. J. (2008). Directions in reintroduction biology. Trends in Ecology & Evolution, 23(1), 20-25. Bowkett, A. E. (2009). Recent Captive‐Breeding Proposals and the Return of the Ark Concept to Global Species Conservation. Conservation Biology, 23(3), 773-776. De Courcy, C. (1990). Evolution of a zoo: a history of the Melbourne Zoological Gardens, 1857-1900. Gewin, V. (2008). 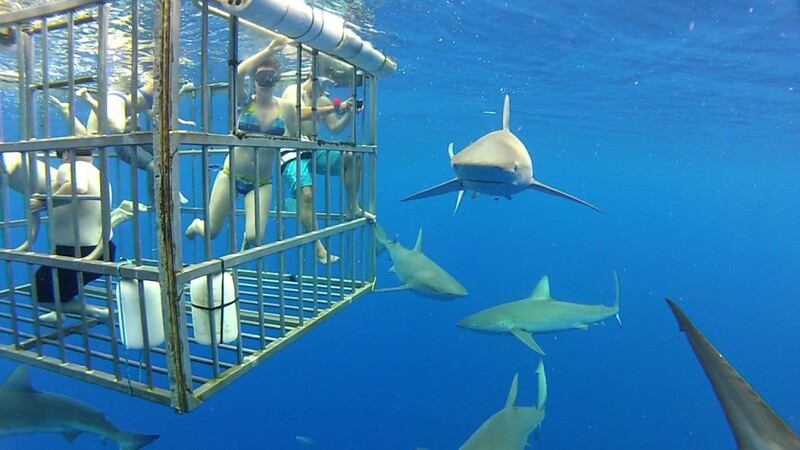 Riders of a modern-day Ark. PLoS biology, 6(1), e24-e24. Griffiths, R.A., Graue, V. and Bride, I.G. 2003. The axolotls of Lake Xochimilco: the evolution of a conservation programme. Axolotl News 30: 12-18. Harlow, H. F. (1958). The nature of love. American psychologist, 13(12), 673. Hayes, M. P., Jennings, M. R., & Mellen, J. D. (1998). Environmental enrichment for amphibians and reptiles. In Second nature: Environmental enrichment for captive animals (pp. 205-235). Hoage, R. J., & Deiss, W. A. (Eds.). (1996). New worlds, new animals: from menagerie to zoological park in the nineteenth century. JHU Press. Hutchins, M., & Smith, B. (2003). Characteristics of a world‐class zoo or aquarium in the 21st century. International Zoo Yearbook, 38(1), 130-141. Jones, C. 2002. Water quality model for the reintroduction of the axolotl (Ambystoma mexicanum) into the canals of Xochimilco, Mexico City. Undergraduate Honours theses, Trent University Peterborough, Canada. Maas, P.H.J. (2014). Aurochs – Bos primigenius. In: TSEW (2015). The Sixth Extinction Website. <http://www.petermaas.nl/extinct>. Downloaded on 28 August 2015. Miller, B., Biggins, D., Hanebury, L., & Vargas, A. (1994). Reintroduction of the black-footed ferret (Mustela nigripes). In Creative conservation (pp. 455-464). Springer Netherlands. Nekaris, K. A. I., Campbell, N., Coggins, T. G., Rode, E. J., & Nijman, V. (2013). Tickled to death: analysing public perceptions of ‘cute’ videos of threatened species (slow lorises–Nycticebus spp.) on web 2.0 Sites. PloS one, 8(7), e69215. Nekaris, K. A. I., Shepherd, C. R., Starr, C. R., & Nijman, V. (2010). Exploring cultural drivers for wildlife trade via an ethnoprimatological approach: a case study of slender and slow lorises (Loris and Nycticebus) in South and Southeast Asia. American Journal of Primatology, 72(10), 877-886. Nowell, K., & Xu, L. (2007). 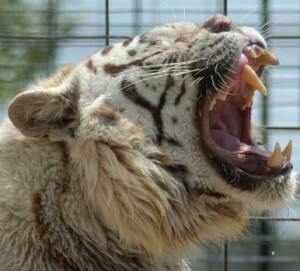 Taming the tiger trade: China’s markets for wild and captive tiger products since the 1993 domestic trade ban. TRAFFIC East Asia. Rumbaugh, D. M. (1997). The psychology of Harry F. Harlow: A bridge from radical to rational behaviorism. Philosophical Psychology, 10(2), 197-210. Spitz, R. A. (1945). Hospitalism; an inquiry into the genesis of psychiatric conditions in early childhood. The psychoanalytic study of the child, 1, 53. Stamps, J. A., & Swaisgood, R. R. (2007). Someplace like home: experience, habitat selection and conservation biology. Applied Animal Behaviour Science, 102(3), 392-409. Teton, J. (1988). “Archives de l’Aquariophilie: L’aquariophilie a-t-elle évoluée considérablement depuis des décennies ?”, Revue Aquarama. Have you ever read the Heinlein story “Goldfish Bowl”? It says a lot.